Exit Glacier is located in the Kenai Fjords National Park in Seward, Alaska. This glacier is constantly changing, so you never know what kind of climbing you're in for. You could climb Exit Glacier a hundred times and never see the same crevasse twice. If you're not an experienced ice climber, there are a couple of guide companies in Seward you could go with. We went with Exit Glacier Guides and had an awesome experience. Our group was just us two and one other couple and the guides were really knowledgeable about the glacier and the surrounding land. The hike begins at the base of the glacier, where there's a visitor center and bathrooms. As you drive into the park, you will see dates marking where the glacier was that year. It's insane to see how much has melted in such a short time. Even as you hike up, you'll notice the how the age of the forest changes. After hiking up the moderately steep trail for about 2.25 miles you'll arrive at the glacier, where you can layer/gear up. 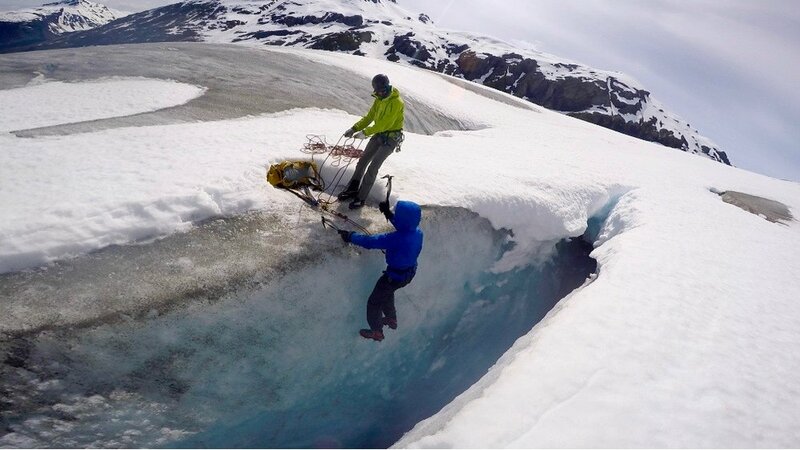 You can never be sure where a new crevasse has formed underneath the snow, so be sure to use a long probe to check that there's solid ice beneath you. Take in the enormity of the glacier and the views of Seward as you hike around looking for a good crevasse. Once you find one, strap in and get climbing. You could easily spend all day out here, especially with the midnight sun lighting your way. Unfortunately, dogs aren't really built to climb glaciers (at least our two aren't), but this is one activity you won't want to pass up. We HIGHLY recommend Seward Dog Lodge for daycare. We were able to drop Bosley and Mila off with Heidi at the lodge in the morning before heading to the glacier. Rather than locking your dog up for the day, Heidi takes the group on an off-leash hike. We loved getting photos of Bosley and Mila playing in the lake with all the other pups while we were up on the glacier. Plus, it was only $55 for the both of them for the whole day ($30 for the first dog, $25 for each additional dog) and it's right down the street from the glacier. We stayed at Silver Derby because it was the cheapest and most secluded of the campgrounds. We didn't need to make reservations and it was self-pay, but it could get crowded depending on the time of year. We didn't stay at Miller's Landing, but we used their coin-operated showers and hung out on the beach for a while to watch the sea otters frolicking in the bay. 12 walk-in sites, but pets are not allowed. Click here for more information about camping with dogs in Seward.